Looking into her blue bottle Biddy was able to know the future, understand what cures to offer, and even listen in on distant conversations. 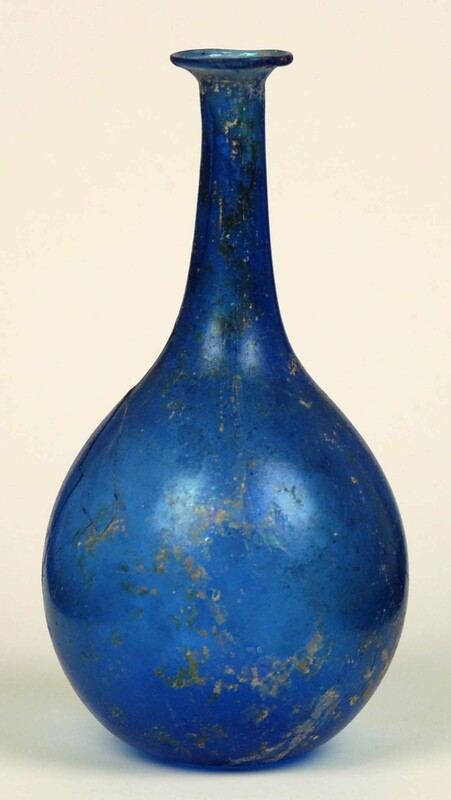 It was said to be a faery bottle, given to Biddy by her son – whether before or after he died is one of many contradictions in the historical writings. When she died the bottle was thrown into a lake near her cottage, returned to the faery folk for safe keeping. Many have tried to find it, none have. From all accounts it probably looks like this first century piece. Most stories about Biddy mention the bottle, including this one from the collected works of Lady Augusta Gregory. She was as good, and better to the poor as to the rich. Any poor person passing the road, she’d call in and give a cup of tea or a glass of whiskey to, and bread and what they wanted. … One time she called in a man that was passing and gave him a glass of whiskey, and then she said to him, “The road you were going home by, don’t go by it”. So he asked why not, and she took the bottle – a long shaped bottle it was – and looked into it, holding it up, and then she bid him look through it, and he’d see what would happen him. But her husband said, “Don’t show it to him, it might give him a fright he wouldn’t get over”. So she only said, “Well, go home by another road”. And so he did and got home safe, for in the bottle she had seen a party of men that wouldn’t have let him pass alive.